The watch I ordered is absolutely excellent. excellent fit, looks better than the picture!!! chronograph is good, dials are clear, and the buttons are solid. strap feels really solid i am constantly taking on/off and it still feels and looks good. Goes really well with any formal wear.I have a slim wrist but this looks good on it not overpowering/too large. only downside is no date on the face of the watch which i didnt realise at the time of purchasing. My last watch had the date display on, and i actually miss that more than i thought i would! The watch arrived at the time expected and it looked exactly as the picture ! My boyfriend loved it. 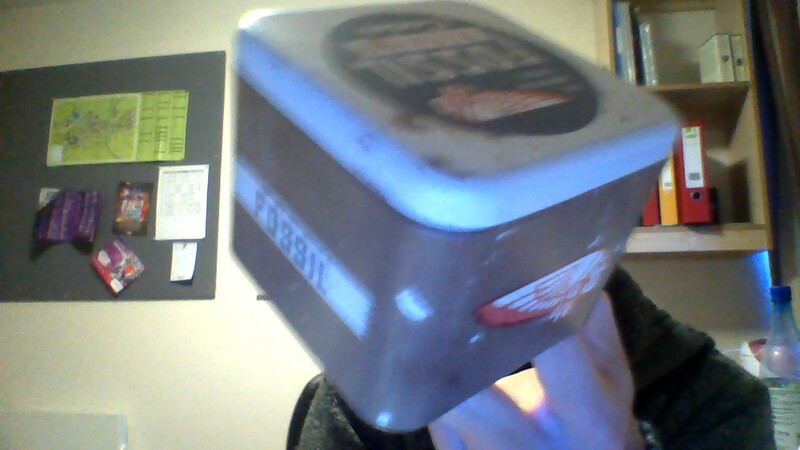 I only have one remark to the way it is packed inside the fossil metal box .. could be slightly more protective. Overall, an excellent purchase experience ! It was a birthday gift to my brother and I find it a value for the money watch, an excellent fit and design. I highly recommend it to someone with a small budget. I recently purchased this watch as a gift and was not disappointed as it is a great price for its style and quality. The rose gold details such as the hands of the watch complement perfectly with the black face making it a very fashionable watch. The brown leather strap is excellent quality and very comfortable to wear. Compared to other watches of a similar price I feel that this one really gives value for money as it is so well made and has careful detailing in the chronograph. The watch arrived in a colourful tin box and included a full set of instructions and a guideline on the watchs water resistance which is useful information to know. Excellent watch, attractive to look at. Good strap and fast service from watchshop. This watch was purchased for my fiances birthday and he was very pleased with it. The watch is a good size and the dial very clear. Looks and feels like good quality. Very much worth the cost. Beautiful watch, smart-casual. Nice and chunky, quite large but fits my wrist nicely. The watch was absolutely perfect and was even better looking than on the website. Perfect for my partner and he absolutely loved it. Will definitely use watch shop again. The service I received was second to none. 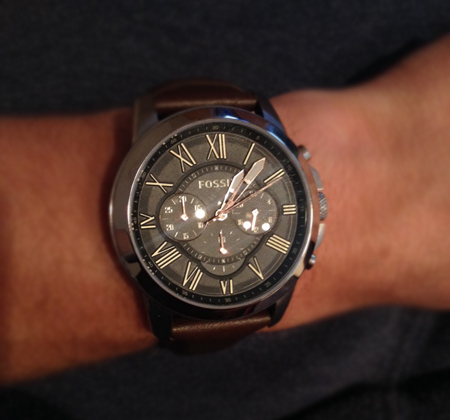 Super fast, super price, super product, absolutely love my new Fossil watch. The correspondance received from Watchshop has been really reassuring throughout and although I dont envisage needing it, Im sure if the service so far is anything to go by, the aftercare customer service will be equally perfect. Thanks ever so much, look forward to dealing with you again and Ive already recommended your company. Speedy delivery, looks nice and smart, nice dark brown leather strap and big face, a fantastic present. Great quality and good looking watch. Bought as a Christmas gift for my boyfriend and he loves it ! Watch has a solid dark brown leather stripe that will last few years at least. The watch face also looks amazing but I just wish it to be more shiny like FS5151 model with Navy blue face. Beautiful watch, cant wait to give it to my boyfriend for Christmas. Th e watch is a christmas present for my son and the reason I bought it was because I was looking for a nice brown/tan strap and big face, however, I was slightly disappointed that the crown strap is darker than can be seen on display via the PC. I hope my son likes it. Lovely watch. Bought for a christmas present. Im sure he will love it! Amazing service- fast delivery and product in prime condition! Will definitely be bringing my custom to Watchshop again! Perfect gift for my husband, good quality, he loves wearing them! 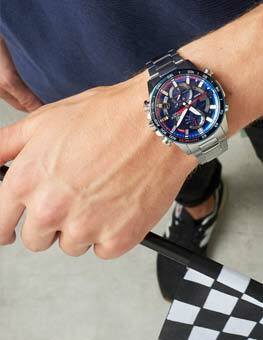 Really nice watch, this is actually the second one i have brought I go one for my boyfriend a few years ago unfortunately he lost it when abroad, i gave him the option to get a different design this will be his xmas present but he wanted the same one. Great design and great quality. The leather is strong but soft and supple. looks good with casual and smart outfits. Lovely looking watch and seems to be a great build quality. Nice colour strap and looks much more expensive than it is. Plenty of comments from people that like it. Very lovely watch, lovely box, great service and hope my fiancé will like it for Christmas. Absolutely love this watch! Face is crystal clear and the strap is real quality leather. Despite it being a big watch, its not heavy and awkward. I would definitely recommend it! Beautiful watch at a great price! Very fashionable watch which looks great for both work and casual wear. Very smart! This watch is a present for my sons upcoming birthday so I cannot review everything about the watch as yet but can say I am very pleased with the look of the watch and with your service so far. The watch looks great, the strap feels good quality, much better than my old watch. Had a few compliments on it already. Also like the size, not ostentatious or too oversized like some watches you see. Bought this as an extra 21st birthday present for our son, as a keepsake. Our son has fairly small wrists, so I was worried the watch might look too bulky on him. I neednt have worried, however, as it looks perfect on him and he absolutely loves it! 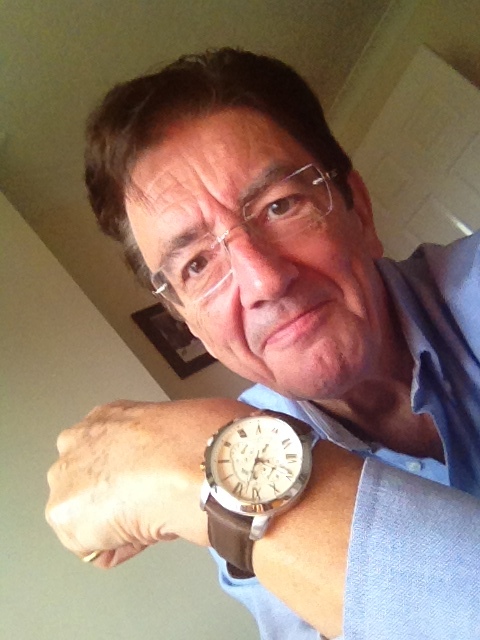 It is a watch that can be worn for all occasions and my son says he will treasure it for ever. As an added bonus, we had the watch engraved and there was a lovely amount of space on the back to add a well-worded sentiment. All in all a great product, suitable for all occasions. Looks classy but cool! Liked this watch for its colour & style. price ws under our budget..good decision. Bought this watch for my Dad for his birthday, he was turning 50 so I tried to choose a design that wasnt to crazy as he doesnt really like flashy things. He loved the style of it and it fits him well. I think it looks amazing online and even better in the flesh. Looks so much better in real life. Nice thick leather strap. Face not to big. Easy to read. Looks great on. Gift for husband and its not his usual style but he loved it. An excellent watch with a fantastic look and design, a great purchase. A lovely watch that is going to make an amazing present! I thought the watch was very smart and can be worn for many occasions. Very good price and good product throughout. Would highly recommend. Ordered this watch for my son , site easy to navigate , quick delivery and my son was really pleased with the watch . The watch is great quality and worth the price. Would recommend and will buy from here again. The delivery arrived very quickly and my husband is really pleased with the look of the watch. I would buy from them again. I bought this watch for my brothers 18th Birthday present as I know he loves the brand as they are always well made stylish items. I think its a lovely looking watch very smart with a really comfy strap. Bought as a gift for my husband, he loves it. It looks great, really smart, and the strap is a nice size. Only thing that lets it down is the 4 and 9 in Roman numerals is not right. Seems an odd thing to get wrong! Having celebrated my big birthday of 50,on Friday 22nd January. My sister sent me a cheque for me to buy something. So,having heard a lot about Fossil watches I,ordered this bought this excellent watch on the Sunday and got it Monday!! Overall very pleased with my purchase.As usual the customer service from Watchshop is excellent,and rapid delivery! Overall a smart looking watch,fits with casual wear,or anything else I would imagine. The dials are easy to read,offset by the black face and gold numerals. One last mention,is the tin box it came,in,its ok,but would have been nice for some soft material for the watch to rest in. 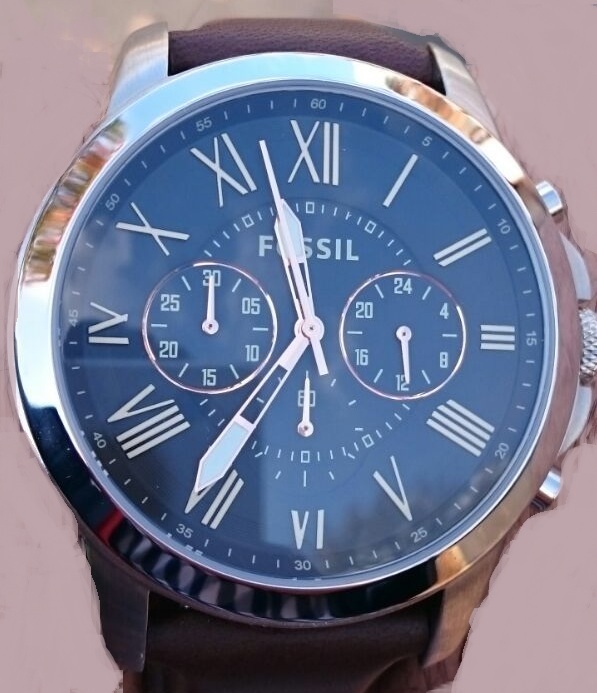 I bought my new Mens Fossil Grant Chronograph watch FS4813 a few days ago and Im really happy about my choice due to the quality of this product and all of its features. It is a pretty good looking watch and goes with everything. It feels solid and has amazing colours. I really like its analog display and the leather calfskin band with buckle closure. It is water proof and also has a nice chronograph subdials. Even though roman numerals are technically incorrect for number four and number nine, this watch is very comfortable and this little thing does not disqualify it. If you are looking for an excellent watch to dress with everything this could be perfect and Im witness of that. Thank you very much for reading this review. I hope it has been helpful for your choice. Brought his for my fiancé for Christmas and he loves it. Its a great watch. Where do I start? Easy to navigate website where I found what I wanted at the click of a button. Simple checkout service and quick delivery. I ordered on Saturday and my item was delivered on Monday given it was Christmas week I wasnt expecting such quick turnaround. The was a Christmas present for my husband and he is thrilled with it. Very good quality and no problems with it at all. The bonus was that it was £30 cheaper than in the high street stores. Cant find fault and will definitely shop here again. I bought the watch for my son, who loves it,he is having trouble with his eyes so the large numerals are ideal yet it still looks quite young and trendy. He said it is comfortable to wear. 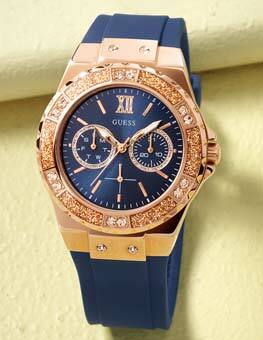 A fabulous watch - great quality looks much more expensive on. The rose gold dials are in particularly special. The service was quick and efficient. The price was the best about. Delivery was excellent , ordered before 5pm and it was delivered the next day. Would recommend watchshop to everyone. I bought this watch as a gift and it came beautifully wrapped. My bf loved it and fit him perfectly. Lovely, stylish watch and very quick service. I was pleased with the box that it came in and Im looking forward to giving this watch as a present as they will love it! Bought this Fossil watch for my son for xmas and Im delighted with the watch itself and the service from Watch Shop was second to none. Received my delivery on time and was kept informed by email of every stage of the order process. I had seen the watch at a much higher price on the high street and could hardly believe this would be the same spec and model when it arrived. The watch has surpassed my expectations , so so impressed as it was indeed the same and really well packaged and presented for a gift. Delighted and will be recommending Watch Shop to friends and family. Brilliant service, the choice of watches to chose from where great and found the one I was looking for almost strait away. The shipping came on the day I needed it to. I had this item gift wrapped and it looks perfect for Christmas. Really happy with my purchase. The strap looks great and the face of the watch is nice and big. My husband will love this when i give it to him on xmas day. The delively was amazing from the watch shop. I wouldnt go anywhere else for my watches. Great price great service. Bought this watch for my husbands bday present and he absolutely loves the watch!! Fantastic item!! Very smart and amazing value for money! Its a must buy, I cant rate the item enough! Best service Ive had from an online retailer. I bought a lovely watch for my partner. It is a brown fossil watch which looks really smart. It came in a lovely gift box as well. It had a brown leather strap. Lovely watch its for my son for Xmas. Bought this as a birthday gift for my other half. He loves it so much especially the colour contrast, how the needles of watch is in rose gold tone as well as the roman numbers. Although only after Ive purchased it, I just realised some of the roman numbers were hidden underneath. Nonetheless, I still think it is a perfect choice and hoping he will likes it. He doesnt seems to notice about the roman numbers cause he is too busy adoring the watch! Haha. It looks perfect on him! Ive a tough time picking which watch to get him but I am so glad I pick this one. It surely is a perfect gift! I found this watch absolutely exceptional. Not only does it look good, the design is very classy and very easy to wear. When I put it on and strap it it is very easy to do and comfortable so the material of the strapping is great. I love the interior design which looks very sophisticated and I am a big fan of the Roman Numerals which add to the sophistication. 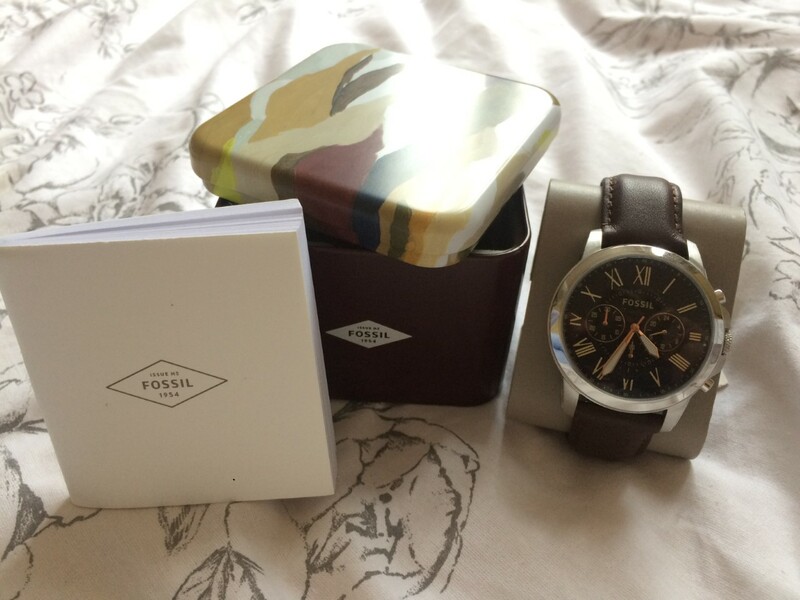 After this purchase I would recommend Fossil watches and shop at watchshop as the purchase went smoothly and quickly and the product itself was brilliant, all round it was a brilliant purchase. Very pleased with watch and the service. This watch is very stylish in an understated way and can be worn at any event with any type of clothing because of this. My husband doesnt like flash and appreciates the timeless style of the Grant watch. It has a brown leather strap which is very comfortable and the mineral glass on the face looks very sturdy. The dial is large enough to read the time with ease and has the smaller dials on the face as well, making the watch look far more expensive than it actually is. The added feature of a stop-watch is useful too for my husband because the industry in which he works sometimes requires him to time certain things, which he can now do with ease. All-in-all I would recommend the Grant watch highly. My boyfriend picked this watch for Christmas, so I ordered it and came really quickly, but I was far from impressed, it looked like it has just been shoved in the box like something youd spend a tenner on, and the finish of the watch wasnt excellent for the money, he says he likes it, but I am really not impressed, wont be buying from watch shop again..
Beautiful watch. Looks so stylish, yet so simple, Budget watch, perfect for all occasions, plenty compliments received! The watch was cheaper somewhere else, but with price match, Watchshop approved it within hours! Will definitely be buying future watches from here. Beautiful watch, perfect for all occasions, looks stylish and rich! An excellent service, delivery was unbelievably quick and an excellent product. This is a beautiful looking watch that is very comfortable. Despite the fact that it looks quite large it is fairly lightweight. The face is free from too many dials and is easy to read. This watch was a gift and I love it. The watch I brought for my son was great it had the right look he was looking for and really good quality,the price was right as well . I love WatchShop, easy to order, fast delivery, great product! I picked this item as I wanted to purchase a watch that could be worn casually or formally - and that is exactly what this watch is - casual/smart. I love a brown strap I think it is really rich/expensive looking. The watch looks like it cost much more as with most fossil watches than it did. It is a nice size - not too large and not too small. A perfect present for dads, boyfriends, sons, grandads - would suit any age! Watch is beautiful would defo recomend. Service was good watch came on next day deliver. Gift wrap option not advised as was not very nice. Impressed with the quality of the watch and service. Love the watch, speedy delivery. Over the moon with the price and the speed of the delivery my son ordered the same watch from America last year and he said it was a great deal .I order one from you 3days later it arrives and I got a better price than he did so thanks. very beautiful. My partner was very impressed, and I had it engraved which looks lovely in the well sized silver plate on the back of the face. Lovely!! Love the copper trim on the watch face and brown strap that comes with it. Some previous reviews complained about some of the roman numerals being clipped, but not a problem in my opinion. Love the watch, brought it for my husband and he liked it too. The whole product and service was excellent. 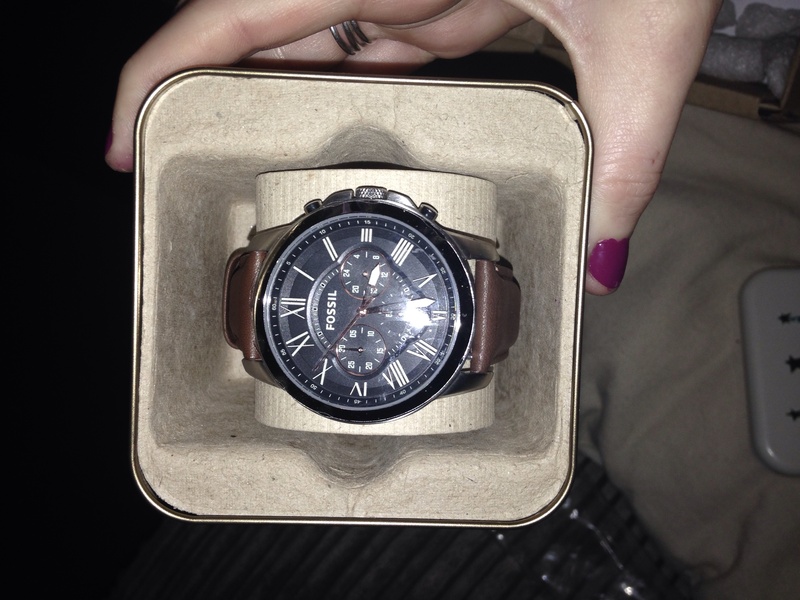 This is the 2nd Fossil watch Ive owned. The 1st Ive had for over 7 years, and as it was going to be needing a new strap, I thought Id update. I love the leather strap, and the black face with subtle gold features look fantastic. Very glad I bought the watch, and at a great price and service. Thanks watch shop, highly recommend! I am very pleased with the watch, it looks beautiful and is exactly like the picture. It was bought as a gift for my son, it is his first proper grown up watch and he absolutely loves it. It fits great and is well made. Beautiful design. Definitely a great gift for boyfriend/husband. Compliments both casual and professional look. 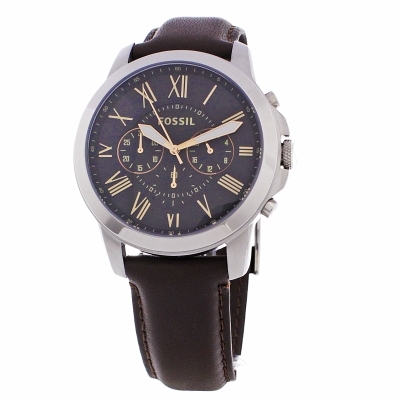 Fossil Grant Chronograph Watch with brown leather straps and a black dial. This was a gift for a friends wedding. 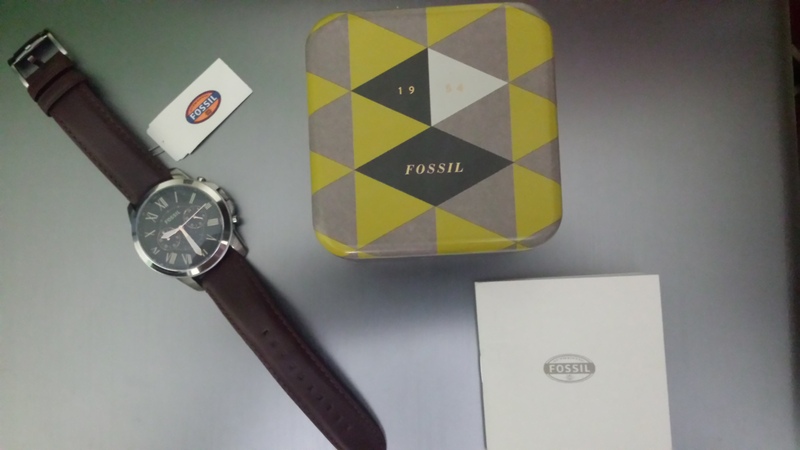 Fossil is a great brand and very on trend. This watch was great value for money and looked ultimate much more than it cost. It is stylish and a great wear. I bought this has a gift and they loved it! I reckon the only improvement would be to include a date function. Great colour, stylish and trendy! A very handsome looking watch. Not too big and the dark face and copper dials are very complimentary. This was a classy gift for an 18th birthday present. It was pleasing to the eye, not over the top in appearance. The brown strap was made well and the face of the watch had a few dials on that I knew my nephew would like. My nephew was very pleased with his gift! The watch arrived in excellent condition and arrived in the time period provided. I bought this watch as a surprise for my husbands 24th birthday. He has wanted a new watch for a while and this one is just perfect. It is modern and stylish but also a watch that wont go out of style. It has impeccable quality and comes in a lovely box too. I can see the watch will last for a long time. The face is clear and has a lovely design! Nice and elegant watch at a reasonable price. I only miss the display of the date on it. Nice looking watch, exactly as advertised and strap fits snugly once the leather is broken in. Only gripe is the incorrect roman numeral for the number four, which I only spotted after wearing for a few days. It may have been an intentional quirk but does make you feel a bit like your wearing a watch that wasnt quality checked for glaring errors before being produced. Other than that Im happy with it and for the price is excellent value. On a further note I am a first time user of WatchShop and would definitely recommend them given the quick and easy service. This watch is well made, excellent quality strap with mulitple adjustment holes - great as my husband has huge wrists but last couple of holes fit him still. Easy to read dials and looks great with jeans or if wearing a suit - had many comments on it and a few have said they want the same one!! I havent seen any negatives with design or workmanship - all happy. Great watch detail just as it looks on the website. This is the second time I have purchased a watch from the watchshop. Fast delivery and would recommend to other buyers. Super Birthday present for my dad! Watch looks a lot more expensive with the black face rather than the cream faced one I bought for another gift. Really stylish and a good size with a clear face so he can see the time at a quick glance. This is the second one of these watches I have purchased for gifts so would not hesitate to recommend to others. I was really happy with the watch. Te colour was as describe, the quality of the item was fantastic and it completely fulfils its purpose. Te description was so good, I knew exactly what I was expecting from the watch and that is exactly what I received. However, one downfall was the fact I ordered gift wrapping which I was let down by. The wrapping was just white paper and a green ribbon which I found wasnt worth the price I paid for it. The message I had written was stuck on with a sticker which was crumpled in the card. I think to improve this, the message should be printed onto the card itself and colours should he available to choose for gift wrapping. this watch is a great looker,it oozes class, looks really stylish. the watch face is black with easily read numbers and large hands and three small round faces with sec,min,and hour segments which can be on or of with push of buttons on side of watch. the leather strap in brown is excellent have nothing bad to say about watch. IT is worth every penny!!!!. well received gift at a very reasonable price. My son has worn the watch from the moment he received it.Everything works..
Service, delivery and delivery updates were excellent. Great quality product, as described. Nice black dial is very good and unique. The leather strap gives a classy feel. I purchased this watch for my sons 23rd birthday and he absolutely loved it. Its been a long time since he has worn a wrist watch as most people rely on their mobile phones for the time he admits it has taken a bit of time getting used to having something on his wrist again. But he says that the real leather strap has only taken a week or so to soften up a bit and has now moulded nicely to his wrist. It is also a very classy looking watch with out being too fancy . It has also proved invaluable in the workplace where it is not always possible to have a phone on you. Overall really pleased with the watch. Im very pleased with the item and so is the person I bought it for. Its an amazing watch and very good quality. Would definitely buy from this website again. The watch itself was ordered in perfect condition. It was given as a gift and the receiver loved it. The colour and quality of the product was excellent. There is nothing negative I could say about the watch. The receiver loved the watch so much they wear it all the time. Due to the brown colour it matches most outfits. The picture provided on the website is true to what the watch looks like in person. Overall a definite recommended purchase! 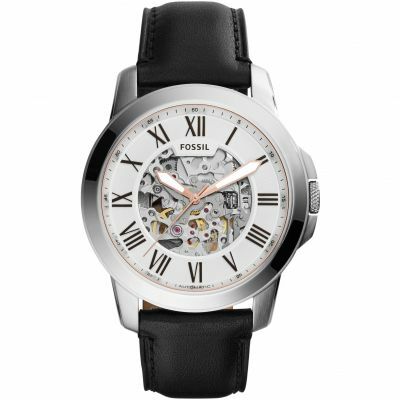 The Mens Fossil Watch is really nice!! Hubby loved it, its nice, not over the top, classy leather strap, nice face, not too large on the wrist and is perfect for a man to wear every day. Its not bling bling and very understated but very classy. Bought as a present for my 16 year old son and he is very pleased with it, gorgeous watch, worth every penny! Excellent quality and fit, even better than the picture. Definitely recommend. 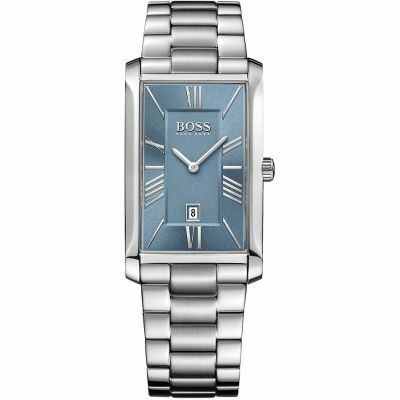 I brought this watch for my boyfriend for Christmas because of the good price and the quality of it, I was deciding between this one or the one with the cream face and decided on this one as I think it would suit his age range better my boyfriend is 18. When it arrived it was a little bigger that I had expected but its just right for the average male wrist! It looks really expensive, which is great considering the price! The leather is good quality, although a little stiff but Im sure it will loosen with wear! The watch face is beautiful, although one of the numerals is half chopped because of the chronograph but I wouldnt of noticed if I hadnt seen it on other reviews! At the moment he has a silver all metal one and I thought this one was nice and different and the brown leather is really nice I think! The back of the watch face is clear of writing apart from round the edge so I was able to get it engraved to make it an even more special gift! The packaging is nice, I had no problem with the tin box it came in! Only thing is the cardboard inside, might of been nicer to have something abit more impressive but the box doesnt matter so much ecspecially if its a self purchase of course! If youre debating getting this watch I think you should go for it! Its so much nicer that the picture shows it as, and fingers crossed my boyfriend agrees! Excellent quality, very stylish. Arrived quickly and in a lovely presentation box. I always worry about ordering on line as you dont know what youre getting until its here. However, when this watch arrived I was so pleased with the quality and the packaging etc. It was delivered when it said it was going to be, which was only a couple of days. The product itself is finished to a really high standard. The brown leather strap is a really nice tone and just how it appears to be on the website good finish and adjustable. The watch face is lovely with a black background and bronze hands, and generally a lovely fit. I bought this for my 32 year old Fiancée. Overall, this product makes a perfect gift and I would definitely recommend this watch and the company to any of my friends and family. I ordered this watch for my son knowing that I was going to get a watch of excellent quality and design after purchasing the same watch for my husband last year. It keeps excellent time and looks really good on his wrist. Great looking watch! Looks much more expensive than it was and significantly cheaper than the high street. I was also impressed by how quick the delivery was! Loved this watch. My daughter bought it for her boyfriend. It looks more expensive than it is. Nothing more to say. great gift for men of any age. So had that I selected the best one. I bought it for my boyfriends 21st he absolutely loved it . It is the right mix of youthful and mature . The black face is very sharp and it looks very expensive. The leather is of very good quality. It was an excellent buy. An excellent purchase. A really solid looking watch with a sturdy brown leather strap. The bronze hands really stand out against the black face. I bought as a birthday present for my husband who is very fussy about watches and he absolutely loves it. Delivery was next day. The price was the best I found and I would highly recommend! I have ordered this watch for my boyfriend for Christmas. First of all what stood out for me was that I can return it until 31st of January which is essential when ordering a Christmas gift. I opened the package and I really liked the box that I have gotten. The watch itself looks a whole lot better than on the pictures so I was very happy with this purchase and I could only recommend it to everyone. Im sure my boyfriend will also love it. I was wary about buying a watch on the internet because you dont really know what it looks like. However this is a fabulous watch and of very high quality and looks even better up close. Delivered on promised day. Bought as a present, he absolutely loves it! Looks very smart can be worn with casual outfits but looks equally as impressive when dressed up for a night out. Definite go to piece in his collection. Bought for a present for my husband and he loves it. I was surprised by the size of the watch face as it was larger than expected, but might be due to my inexperience of choosing mens watches. Nice detailing and colouring on the face combined with the dark background and the brown leather strap make it a good watch for both smart and casual wear. Feels quality. Looks very sophisticated and classy. The number nine looks incorrect as it has been cut off, but other than that its perfect. The watch was a bargain! It looked great and can be used by anyone of any age. It was a Great gift and looks expensive compared to what I payed. This watch is must buy and is a Priceless gift. It works a treat and we have had it for a month or two. It comes with a 2 year guarantee which means that if it somehow stops working you can get it repaired however it will last you as it is quite sturdy. Even though it is very sturdy the watch is very fashionable and good looking. It is a classy watch for any body. Awesome watch and such a great price. It looks cool and comfy to wear! Would suit any age young or old. Leather strap is really good quality and looks hard wearing so should last! It is easy to read the time as it has white on the tip of the hands and glows in the dark! Love it! I had been looking for an hour for month before I ordered it, and the waiting was absolutely worth it! Thats a beautiful watch, very elegant but somewhere also casual. I wanted one which I can wear with suits and with everyday, smart casual or causal outfit, too. It is also very quiet. The leather strap has a nice touch. Overall, its exactly the same as on the pictures. Recommended! The watch was bought for my son for his birthday. He has always had Fossil watches in the past and loves this one! The product was exactly how it was showing in the picture, looks like great quality and came in really good packaging. A really great watch, much better than shown in the pictures. The dont do it enough justice. A good nice, and weight, giving it a nice quality feel. I gave it to my boyfriend as a gift and he hasnt taken it off. Its a brilland watch and really looks good on the wrist. Its a complete bargain. The only downside that I realised later on was that it does not show date. This is a very well made watch under the price tag. Clock dial is broad and trendy and though I was expecting the strap to be a little softer, nice strap nevertheless. #satisfied. Excellent Watch. Love the product. Impressed with the watchshop as it was cheaper in watchshop compared to other shops and websites. My husband has been a big fan of Fossil watches and had been eyeing this for a while. Got this as a birthday present, very happy with the product and the service. The watch is quite chunky & the design is top notch.The black dial with brown straps actually looks better in real and would definitely recommend if you are looking for a stylish gift. Bought this watch for my partner as a graduation present. It was very hard to choose a colour as all looked nice but was unsure about what it would look like in person. Eventually decided to buy the silver one and it looked better than it is on the website. My partner was very pleased with the present and so was I! Thanks for this lovely watch bought for my 15 year old. Great watch with clear face and classy leather strap. Chunky and very modern but lies flat against wrist which is perfect as my son is very slim and many watches sat too high. Great service with good communication. Bought this watch for my husbands birthday and we both love it. great style, strap and face, a classy solid looking time-piece. Wish it had the date feature though. Looks sleek, great contrast between the black and brown. Manual that comes with watch could go into a bit more detail regarding the changing of dates and what the several dials are for. Other than that it has no faults. I chose this watch because of very good design. I like the colour: black and the brown strip. Nice style. Nice chunky watch. Dont see the point of some of the smaller dials, e.g. the 24 hour dial. Really happy with the Watch - seems a good quality product. The service from Watch Shop has been fantastic - especially the turn around from order to receiving the Watch. This watch is absolutely beautiful item and timeless. It can be worn casually or dressed up either way it really dose compliment any look. Was brought as a gift for my husband and he loved it and cant stop commenting on how good it is with style. I had asked a few people male and female prior to purchasing and everyone picked this one and said it looked fab and some were asking where to buy it. Dont debate - you wont regret it for yourself or as a gift it will be admired and appreciated after the response he has had. The packaging was a nice touch in a tin however the cardboard could be improved on but who cares right not like your going to wear the packaging! Other than that that really is it noting but 100% with the watch alone. Beautiful watch, exactly what I was after as a birthday present for my boyfriend. Lovely watch, excellent price. Looks great with casual or smart clothing. Perfect gift for my 19 year old son. Awesome watch, looks amazing and feels good. Good value for money and came really quick with no delays. Arrived in great condition and fits perfectly. Great gift for anyone. The watch was purchased as a gift and he loved it. The strap is a beautiful brien leather and the face if the watch is very nice with Roman numerals to add that extra touch. The fit is perfect for my husband and overall got price range it gets 9\10. 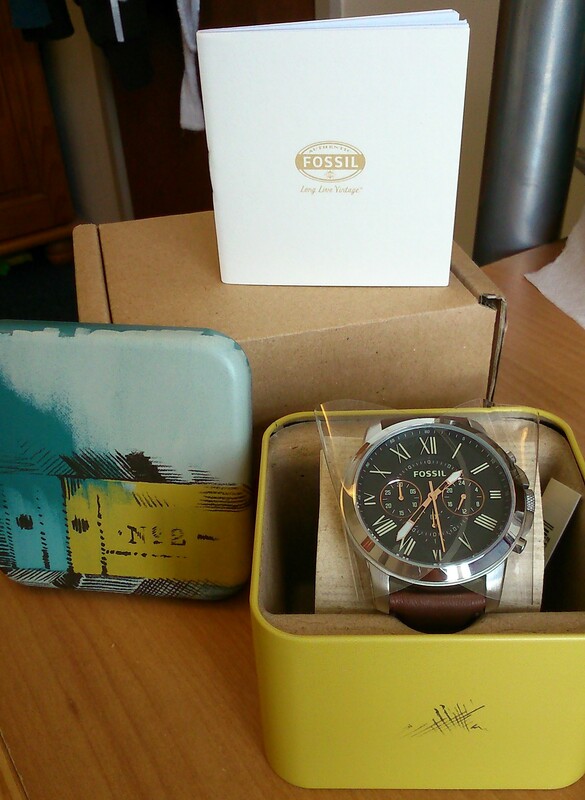 Fossil aw always good value for money and the 2 year warranty is fantastic. The money off through watch shop also impressive. Lovely strongly built watch which does not look too chunky on your wrist. Strap is very strong and comfotable. Bad points- cannot see any at moment. The product is great, just what I was looking for!! It looks nice, feels nice, isnt too big like what you find with othe watches! It looks like its worth more than it actually is, also the luminescent future is worth mentioning as I didnt see it in the details! Wish I could say something I didnt like, if I had to be pushed, I would say it doesnt have a calendar date on it but thats about it. People have given me compliments on it of thats what you want your watch to do, my brother even got the same one because he thought it was that good. Im a watch lovers and this is one of my best ones yet! This is a really lovely watch, it was bought as a present for my boyfriends 21st. I spent hours and hours looking at just about everything available for this sort of price range and it eventually came down to this one with the black or cream face. The cream face is also absolutely stunning they both almost sparkle with clarity and I was very torn, but after asking the opinion of a young sales assistant in his mid 20s in another store, he said he would choose the black face as it is a bit more young and trendy I was also anxious that the roman numerals might be a bit too old fashioned for a 21 year old, but he assured me that they werent, its more personal preference, and my boyfriend really likes it. The rose gold detail is lovely and contrasts really well with the black. The leather strap is very good quality, nice and thick but not too stiff there are plenty of holes for all size wrists. For those interested in engravings, there is plenty of space in the centre of the watch back. The tin it comes in was also a work of art of its own, and I hear they have become something of a collectable. Its a beautiful, quality watch, definitely one of the best in this price range retails around £95 in highstreet jewellers, and with price match offered by WatchShop, its unbeatable in my eyes. Watch still has protective covering in photo, camera phone quality. In the pictures the watch face looks quite big, but I am glad to report that it is a comfortable size that doesnt look out of place on my wrist. The packaging of the watch was a slight disappointment as the watch was held in place by cardboard does the job, I have seen that many other manufacturers use a velvet/cloth holder which gives off a more expensive and luxurious feeling, this would have been nice to see. The packaging inside the tin didnt really matter as it came inside a large cardboard box with plenty of space around the tin. This was filled up with those little foam balls. Which brings me onto the delivery, it was a fast and free delivery that arrived in two days from order. The box arrived just like new, with no holes or damages to the box. All in all the watch feels great, looks great and works great. The chronograph feature and the general build of the watch gives off a more expensive feel than it is. The watch looks good. Strap was comfortable the box it came in was a tad disappointing. Otherwise a good watch for its value. It was a gift for a friend and he liked it. Ive bought this to wear it to my wedding. Its hard to keep it in a watch-box for another 3 months. 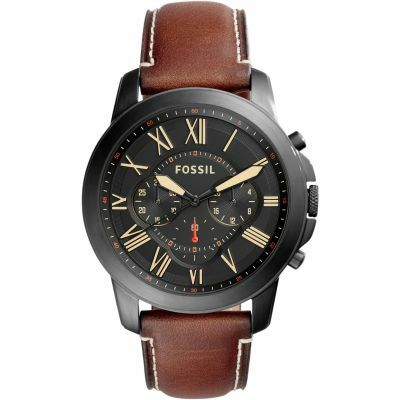 MENS FOSSIL GRANT CHRONOGRAPH WATCH FS4813 is incredible good looking. The Genuine leather strap looks and feels premium. The case came without any scratch I am a detailed oriented person. I thought that one of the sub-dials is for the date, but its not. All 3 of them are used as a Chronograph. It has a super precision , uses a sapphire crystal display.With this, it is possible to worry less about scratching off your watch, but Im sure that I will take a good care of it. Lovely watch, just what I expected/wanted. I like the colour very much and think its a smart watch. Ideal for birthday present. The product lovely and great quality. I bought it for my sisters boyfriend and he loves it. The dark brown strap is a lovely touch and I like the different metals used in the face of the clock. It is quite unique because of these features. Obviously only time will tell if it lasts, but it seems like a timeless piece for an everyday watch. Perfect fit and very comfortable to wear. Can be used for smart and casual outings. I bought this watch for my sons Christmas present. He had been looking for ages but could only find very expensive designer styles, so I was thrilled to find a reasonably priced similar style and design. He loves it - the colour, design and fit are perfect and he has worn it constantly. Even better, he has had many compliments so a good buy. Was a little sceptical at first given the price but the whole experience has been excellent. Customer Service has been very helpful from start to finish, keeping me in the loop on progress. Very happy with the watch itself and of course with the price. Have already recommended to other friends who have ordered too! Ive got this watch for my fiancé as a wedding day present. It is ideal in every way as it is quite simple yet elegant and also fitted my budget. The photo gives it absolute justice and what you see is what you get. The 360 view is brilliant too as it allowed me to find the watch I needed, also to be engraved so overall a brilliant buy. Leather strap lovely quality not cheap at all. Watch face a good size good quality and good weight!! The watch feels classy, its strong and durable. Leather strap makes it look fantastic, and it works perfect. Very impressed with the service - ease of ordering and delivery exactly when it as supposed to be. Product looks great, nice presentation box, watch looks very nice. Gorgeous watch! Bought for my boyfriends birthday, looks loads better in real life too. Looks great with both casual dress and smart suit attire!!! Watchshop delivered immediately and no hassles. I will definitely be a returning customer! The watch is exactly as described. It looks stylish and classy, exactly what my husband wanted for his birthday. Great product. I bought this for a friend and it looks really good. Came in a fossil tin. Would definitely recommend it for others. Would suit a variety of ages. Bought this watch for my sons 18th birthday present. Very prompt delivery. Smart looking watch, looks quite robust and sporty. Presented nicely in a tin box, however tin slightly scratched which does effect the overall appearance. Watch is perfect though. Beautiful quality watch at an exceptional price. 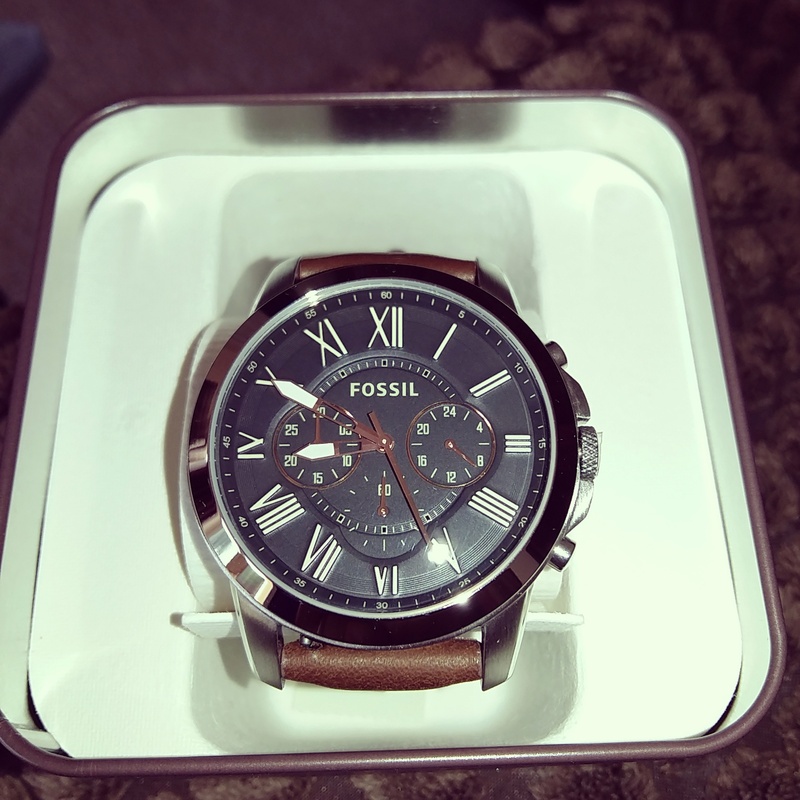 Straight out of the lovely Fossil presentation box, the watch looks gorgeous and has a lot of design detail within the black face which is exactly what I was looking for. The leather watch strap is of a very nice quality although a little stiff at first but one week on this has softened significantly. The great thing about the Grant watches is that additional straps can be purchased from Fossil to change the look of the watch as you feel. These are easily interchangeable by releasing the little clasp on the underside of the strap making the swap quick and easy. The service from Watchshop was also very impressive with me placing the order on 23rd Dec and receiving it on a tracked delivery the following day on Christmas Eve! 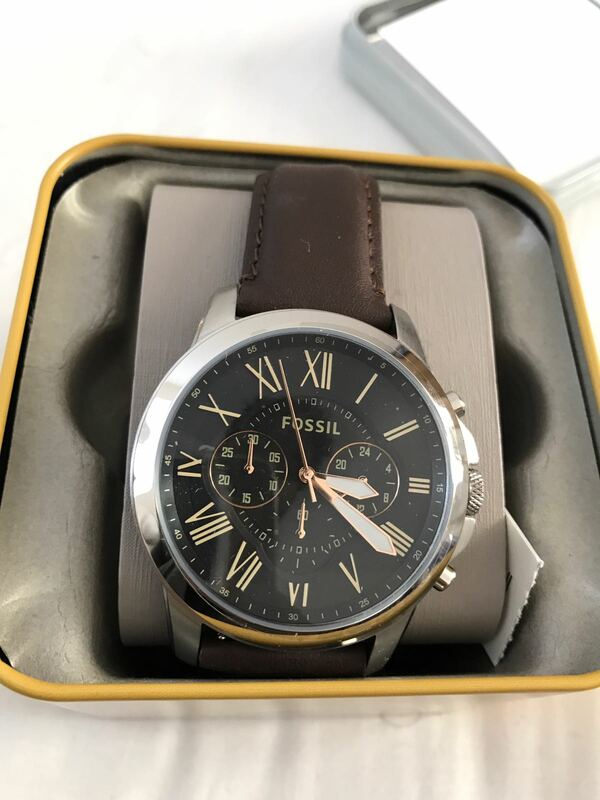 Great watch!love Fossil watches!I order this for Xmas gift and I am very happy.Love the stile looks classy.very happy with the delivery too.came on time in nice box .Briliant ! I am very pleased with the watch and my boyfriend loved it also. Its a gorgeous watch and great value for money. I was impressed with the speedy delivery - a perfect purchase, I would definitely use The Watch Shop again. Great watch. Feels big but still very comfortable. Looks like a few other people would buy because of how good it looks on my hand! Practical yet stylish. Can be dressed up or worn with casual clothes. What drew me to this watch was the dial with Roman numerals. This watch has a big face so would suit a larger wrist better. Excellent value for money. My partner is very happy with it and has worn it every day since Christmas. Great Watch - looks great and good quality product!. Love that it is free delivery! It was a perfect gift. Bought as a gift for my husband. He loves it! Really manly watch, chunky and substantial. The face is clear and detailed. Stopwatch is easy to use. 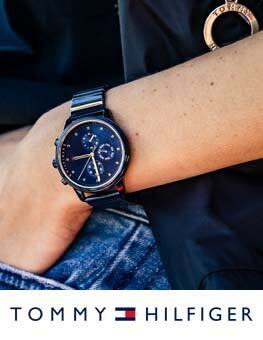 The watch is professional and smart looking but still looks youthful and on trend. Its really a nice watch , good value of money. Brought it as a gift and they really liked it. I bought a Fossil Chronograph watch for my son and he is very happy with it. It is stylish, comfortable, practical and looks as good as many far more expensive watches. The Fossil Grant Chronograph watch is lovely. My son is over the moon with the way it looks - the chunky look and feel are very on trend. The favourite feature is the way you can appear to make time go backwards !!! The strap is brown leather and ties in very nicely with the shape and colour of the watch face. Great. The watch is stylish to look at & comfortable to wear. It was a gift for my 15 year old son who loves it & liked the way it was packaged in a smart tin which he decided to keep. Beautiful watch, exactly what I was looking for. My other half absolutely loved it. The watch makes him look classy at work. So pleased excellent shopping experience product arrived exactly on time. My husband is more than happy with this watch as am I. Excellent product for an excellent price. One happy shopper. It was everything it said it would be, very nice. The face is larger than what it looks like in the picture but still lovely. This watch wAs just what i was lookin for as a birthday present for my husband. 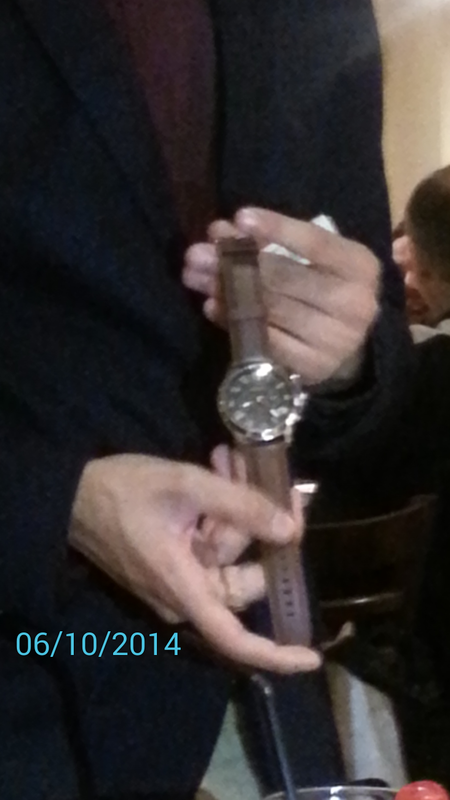 He wAnted a watch with a large clear black face and brown leather strap so as he could wear it with anything. My husband was delighted and loves it, and the clear backing makes it perfect for engraving. stylish and comfortable, a watch for all occasions. The face of the watch itself is clear with a good combination of colours. the strap is smooth and a good fit. furthermore, the dials are easy to read. I so loved this watch that I ended up buying two for my boys. It looks exactly as it did online. The watch arrived just as described, looks exactly as it does on website... was brought as a christmas gift so cannot give a detailed review as its not chtistmas yet lol! Easy to order, quick delivery. Product is great, hopefully my boyfriend will think the same when I give it to him on Christmas day! I am very pleased with how my watch has been delivered and that it is in immaculate condition. 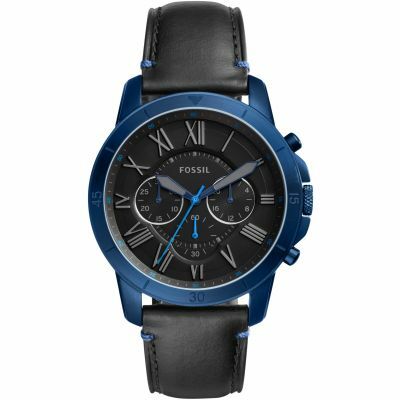 I had ordered the Fossil Mens Grant Chronograph watch with the black face for my other half for Christmas. I believe that the price was definitely reasonable as the watch is of that of such a high quality. The different viewing images and video were very useful when selecting which watch to buy and found the product to be perfect! However, as it is the Christmas season, I am a bit disappointed with the packaging inside the tin holding the watch. It was received inside card board, which I believe held the product in place but I think to improve this, you could have a gift option, whereby you can opt to have your product in a more suitable packaging. This would make the product look even better quality, rather than having it in just plain card board. Quick and efficient service. Watch is a christmas present so hope they like it. 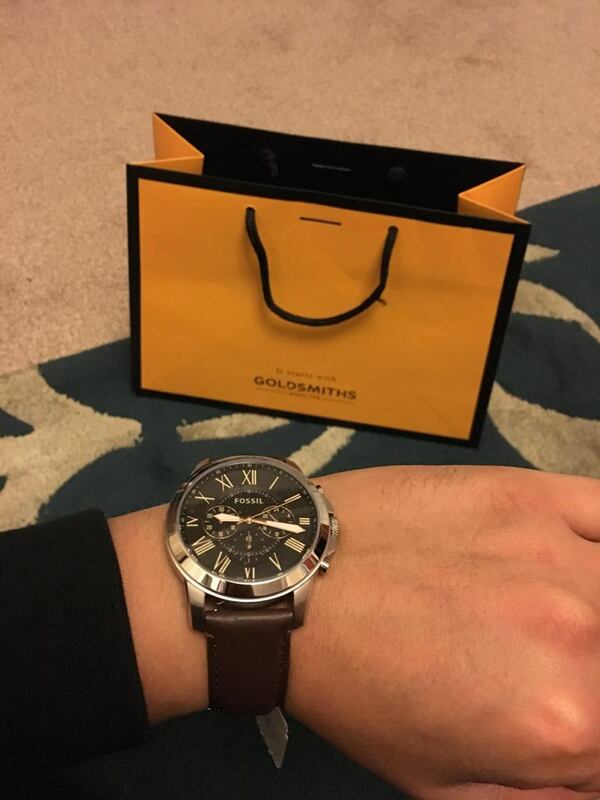 I am very happy with my purchase however I bought this watch for my boyfriend and considering its a mens watch it came in a very girly box... Other than that Im very happy with the quality and price. The product looked exactly how it did in the picture, and the leather and the steel looks great. The leather strap is in mint condition, and the back of the watch is empty, so I was able to add engravement onto it and made it more personal. Perfect christmas present. Excellent service! 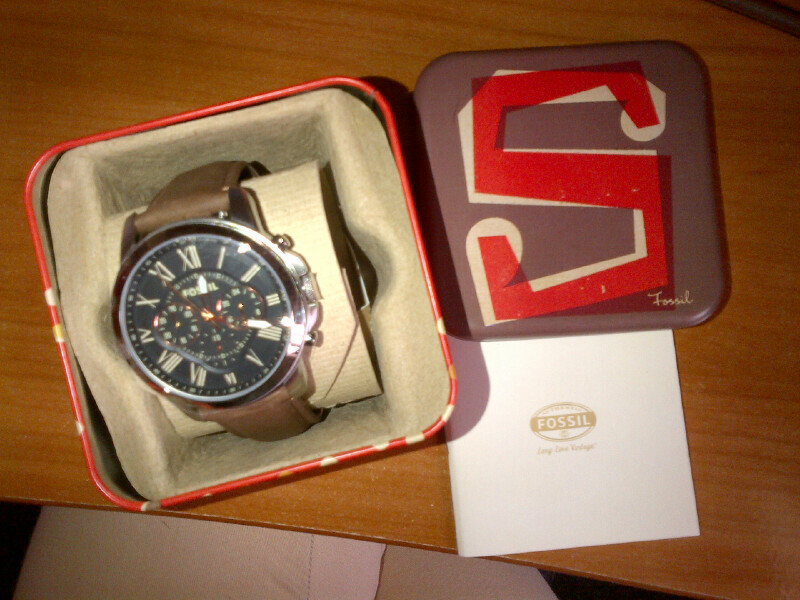 This is a gift for my partner ..... the watch itself is well worth the money. Its a very smart watch and is better than the pictures on the site. I think my partner will be very pleased at christmas. Its a shame the packaging lets it down a little ..... but the product is well worth it. EXCELLENT SELLER! VERY QUICK DELIVERY JUST 2 DAYS CLOSE TO CHRISTMAS EVE... HIGHLY RECOMMEND THANKS. Excellent watch and looked great with the roman numerals and the black face with the contrasting brown leather strap. It actually looks even better in reality than it does in the picture! Makes a great gift that comes in the usual Fossil tin. Nice watch. I think it will be a great gift. It came nicely wrapped and delivered as expected. The owner has not seen yet since its a Christmas present, but it looks very nice and for young men. Better than others I saw at higher costs. 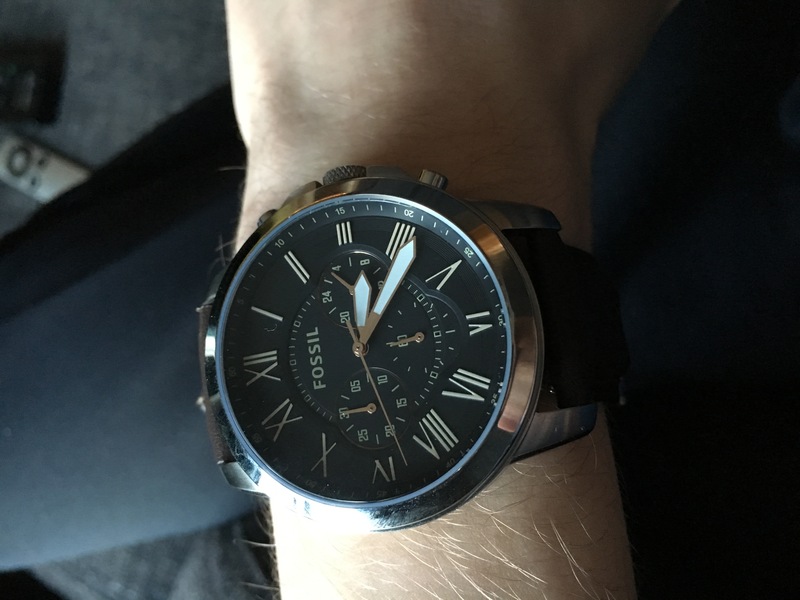 Couldnt be happier with the mens fossil watch i bought from the watch shop. The watch is of excellent quality and it goes with anything, casual or dressy. Brilliant christmas present for my other half. This watch is a Christmas present for my grandson so I cant write a review on the actual watch as I have left it in its original packaging, but the delivery time was very good and the condition of the package was excellent. Bought this wrist watch as a Birthday gift for my husband and am glad he liked it. The watch came amazingly quick and I wasnt disappointed when it arrived. Exactly what I wanted and looks even better in front of you than on the website, all in all a great product and i cannot wait to give this watch to my boyfriend at Christmas! Good quality. It will look great on my fiancé. Nice brown belt and good colour combination. Excellant quality watch, looks even better than in the picture. Good quality, surprisingly heavy. Presentation box has a modern twist as its like a tin with card inside, ideal present for person ive bought for. Im sure my Dad would love the watch but wouldnt be impressed with the box. This is a lovely watch, I bought it as a Christmas present for my boyfriend so I havent heard his verdict yet but I think hell love it. It came in a nice, contemporary presentation box and you could smell the leather when you opened it. The brown strap with the black face means it will go with anything and its a great smart/casual watch that could be worn to work or just everyday. Great value for money too. I think the watch is fine but the box is not good.It has some scratch and it is dirty. I do not like this. Hope that these things will be better on the future. This watch is very smart, I brought it for a present for my boyfriend who loves it. For the price the quality is brilliant. The size and colour is exactly as the picture shows. Gorgeous watch! Is exactly how it is described on here! I was nervous that the watch face would be too large however, now it is here I can see that its going to be perfect! I have bought this as a Christmas present and cannot wait to give it to my partner! It comes in a presentable box too which is an added extra! Ii have bought this watch for my grandsons 18 th Birthday which is early in December. I think it is a very attractive watch for a young man who is definitely fashion conscious. his girlfriend helped me choose the style as she understands his likes/ dislikes. I was influenced by previous reviews which stated it was a young mans watch. I will be able to comment further when i have given it to Tom. The watch itself is beautiful. The contrast between the brown leather and black chronograph face is lovely to look at and the strap itself has become much more flexible after a few wears making it even more comfortable than it was straight out of the box. The box it comes in isnt particularly flashy or luxurious but the product itself is superb and a perfect buy for the price. The look is exactly what my son was after but as it is a Christmas present unable to comment on fit. I was excited to buy this watch as a present for my boyfriends birthday and I wasnt disappointed when it came! The watch is classic, lovely to look at, sophisticated and ideal for a man who likes classic, simple designs! The strap is lovely leather although I wanted it to be a bit darker than it actually is but I can cope with that. My favourite thing about the watch is the face! Its just so elegant and for a male watch thats hard to achieve! It is bigger than the picture indicates which is what I was hoping for. All in all I am very happy with this product and I cant wait to give it to my boyfriend next weekend! 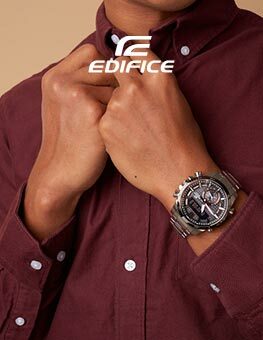 The watch is excellent,the chronograph works well the black face is very attractive, agreat looking gents watch. I love the gold roman numurals against the black face. The brown leather strap is very smart and comliments the watch. The watch fits well on the wrist. I would certernly reconmend this watch to family and friends. awesome style,great color,reasonable cost..i would love it more if the packaging was a little bit fancy inside the box. I bought this watch for my boyfriends birthday and Im really pleased with it! Looks very expensive and classy and Im looking forward to giving it to him. I love the black face contrasted with the brown leather and the rose gold on the face is a nice feature. Also, my boyfriend doesnt own a watch so I wanted to get one that didnt have too big a face, looked stylish and young so that I would be sure he would like it. Im sure he will! Really like this watch, looks smart and is nice to wear. Particularly like the black face. Would recommend this product to anyone. The watch is fantastic, it was for my sons 18th and he said it was his best present. The quality of the leather of the strap is really nice and compliments the face and case beautifully. It comes in a metal tin, and the watch has cardboard through the strap, the cardboard cheapens the whole thing, a piece of eva foam would have been better. Service, communication and delivery was excellent, this was my first purchase through watch shop, i would not hesitate to use them again. Classy perfect watch for work and casual wear. As an author, I have to travel a lot for promotion and it is really useful in different time zones and with deadlines to meet to have a watch with all the chronograph facilities on it that this one has -- which is why I bought it. To be quite honest, it is also a very impressive-looking watch which people notice, so there is a touch of flash about it as well. Quality watch! Smart looking and very stylish, great design to watch face. Very comfortable fitting and sound packaging. 1.The watch band scratched picture attached, although just a bit only but some of the customers may not like it. There have a long scratched at another side of watch band. This is the first watch i have bought in my life, feel badly for the scratched. 1. Check properly before send to customers. 2. Double check for the watch. The watch was excellent, in great condition and reached the very next day. Also I feel the packing was pretty cool. My husband was happy so for me it means thats a good choice! A good quality leather bracelet and it looks very expensive !!! I didnt like the gift rap and the card is cheap! Anyway , what is inside is the main thing, so Yes it is a good choice ! I like the style and colour of the watch. Worth purchase and reasonable price. The watch came super quick and was more then I expected. It looks 100x better in real life then in the picture, I was very pleased with it. The black face with the brown leather strap means that it will go with both black or brown clothes so my partner can wear it with his suit for work and with his casual clothes on the weekends. I find the watch to be perfect for young men as it looks young and fresh and at the same time is suitable for a work environment. I myself have a brown leather fossil watch and find the make to be very good. I would recommend it for people age between 18-30. I bought this watch for my father in law. The packaging was great to start of with. I loved the watch myself. The leather strap had the most amazing finishing touch I have ever come across any of the watches I have bought. The dial is up to date with current trend. Very simple to use. My father in law loved the watch as well. He wore the watch and his exact words were its a perfect fit. Seems like a part of me. I am very happy I bought this watch for him. I would highly recommend this watch to everyone. Definitely a keeper for years to come. Brown is the new cool and the ladies are definitely going to be attracted to it. I got this watch for my boyf and it was PERFECT! He really loved it so much that he doesnt wanna take it off. The purchasing was smooth and speedy delivery! I would recommend this product as it the type of watch you could match it with everything from formal to everyday. This is a beautiful watch, like almost all Fossil watches I have encountered. The black face of this watch contrasts nicely with the silver frame and rose gold coloured chronographs and hands. The brown leather strap is flexible feeling and has an attractive worn look about it. The service was impeccable, the watch arrived within two days of ordering and I was pleased with the safe packaging of the watch. It arrived in a charming gift box, which complimented the style of the watch. I was a little disappointed with the cardboard interior of the gift box, as I have seen other gift boxes with black foam interior which looks more attractive. However, this is a very minor note and overall I was extremely happy with the purchase, its price, and the service I received. I am very happy with my purchase! It looks better as in photo. Fast next day delivery! Loved the website, the options and the delivery method. The product was in perfect condition and it was delivered the very next day. I have never had a better online shopping experience! My husband loves the watch. The pictures give an accurate representation so we werent disappointed! Cant fault it! 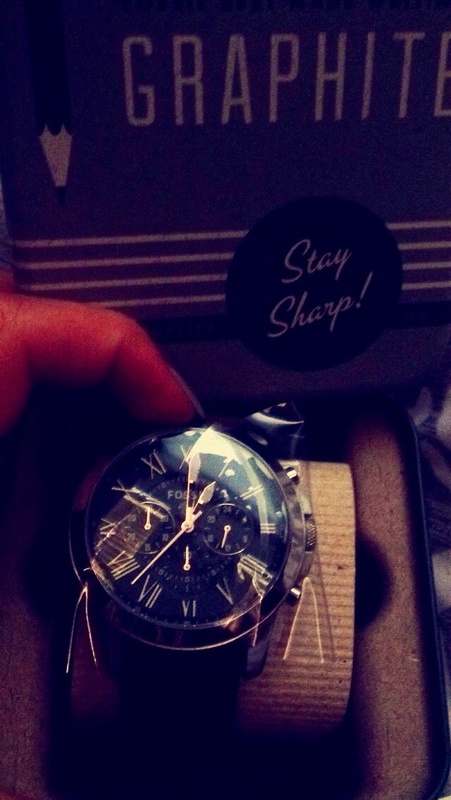 I bought this watch for my self and from the point I opened the box I knew its worth money I have spend. Its an excellent fit on my hand. I am very happy with my purchase! This watch was delivered to my doorstep on the next day as the next day delivery of watch shop promises. Very efficient service. I ordered and received the watch on the next day! I wont hesitate to recommend this site. I am very happy with the purchase. Watch Shop is een geautoriseerde Fossil verkoper.